Following the shooting at Pulse nightclub in Orlando, Cleveland held several events. Two weeks after the most fatal mass shooting in American history, I started crying in the middle of an interview, sitting at a table across from the Einstein’s in the University Hospitals (UH) atrium. For the rest of this eventful summer, no other news story hit me as hard as the shooting at Pulse nightclub in Orlando. I had come during my lunch break to ask Reverend Nancy Lynch, director of spiritual care at UH, about how people here in Cleveland were processing the Orlando shooting. At the end of the interview, I asked if there’s anything we hadn’t covered that I should include in the article. That’s when the interview broke from the norm. “What was your reaction to this?” she asked me. Months later I am still trying to find an answer to that question. The day after the shooting, over two hundred Clevelanders walked together down West 65th Street to fill Labyrinth Park. In a ballroom at Case Western Reserve University later that week, over 100 students, faculty and others stood in a circle, heads bowed. Immediately after CWRU’s vigil, about 20 people sat down in front of a table full of candles in a small chapel in the Church of the Covenant. That weekend at Cocktails Cleveland, drag performers and singers took turns onstage to raise money from a crowd of patrons. I joined in at events, bearing witness to sorrow and anger and interviewing participants and hosts, as across the city Clevelanders gathered to mourn in their own ways for the 49 lives lost in the Pulse nightclub shooting in Orlando, Florida. Ryan Zymler, community relations coordinator for the LGBT Community Center of Greater Cleveland, heard about the shooting on the morning of June 12—an otherwise beautiful, sunny day that he had planned to spend playing kickball and attending a graduation party. Initially, he was angry that the news cast a pall over the day. From anger, Zymler moved into action, working to provide support services for Cleveland’s LGBT community. The next day, June 13, he worked 12 hours at the LGBT Center. “Our focus for Monday was just going to be support, support, support,” he said. While 20 to 25 people came to speak with grief counselors at the LGBT Center and others came to spend time and talk to other LGBT Clevelanders, many also asked if the Center was going to hold an event in response. That Monday, with details still emerging about the shooting, the Center’s staff decided that their support must include a larger event, a walk, where more people could gather. Around 250 people came out with just hours’ notice to honor the lives lost in Orlando. The group crossed Detroit Avenue and then walked up West 65th Street to Labyrinth Park. During the tenth of a mile between the Center and the park, more people joined the group, so a large audience was gathered together when Center Director Phyllis Harris addressed them after the walk. In addition to Harris and Zymler, Council on American-Islamic Relations Cleveland Chapter Board Member Isam Zaiem spoke, and Very Rev. Tracey Lind, dean of Trinity Cathedral, led a non-denominational prayer. After the speakers, the victims’ names were read, and members of the crowd held posters with their pictures and names. According to Zymler, while gathering in a large number in public may have brought some apprehension for attendees, the openness of the event was essential. The LGBT Center continued to push for open events later in the summer, when they stepped in to host Pride in the CLE after Cleveland Pride was cancelled. For Zymler, providing a supportive atmosphere for other members of the LGBT community came first. Processing his own feelings after the shooting had to wait until later. Like the Cleveland LGBT Center’s, the response at CWRU began with one-on-one support, provided by the university’s LGBT Center. Soon, Undergraduate Diversity Collaborative (UDC) President Lilly Tesfai and Residence Hall Association (RHA) President Andrew Dupuis decided that the CWRU community needed more. Together, the organizations hosted a vigil in the Tinkham Veale University Center ballroom on Wednesday, June 15. As it drew nearer to the event’s 4 p.m. start time, the large room held a rough circle of attendees, most standing apart from one another in an unofficial moment of silence. Soon, more filed in, until almost 150 people stood in a circle around the room, holding candles carefully so the wax wouldn’t drip on the carpet. Tesfai welcomed the group, emphasizing the importance of coming together as a community. According to both Tesfai and Dupuis, the goal for this event was to provide a space for CWRU community members to process the attack together. Liz Roccoforte, LGBT Center director, addressed the group, beginning with her struggle to find the words for this situation. She then spoke about the impact of this tragedy on the LGBT community in particular. “This [shooting] strikes deeply because [Pulse was] such a safe space,” said Roccoforte. After Tesfai read the names and the crowd spent a moment in silence, several students and alumni took turns sharing their thoughts. Class of Winter 2014 graduate Zak Khan spoke about the intersections that they experience as a queer, transgender Muslim person of color, and how difficult it has been to process this attack with so many nuances of emotion. According to them, what they needed was to cry it out, and not attempt to rationalize the tragedy. 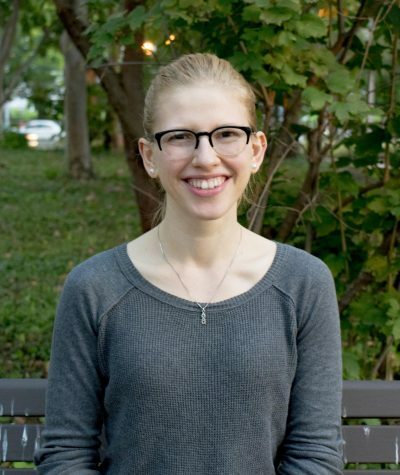 Both fourth-year student Kat Grigsby and third-year Dallas Eckman talked about the impact of this attack on the LGBT community in particular. Eckman read a post calling on LGBT allies to step up in their support. At the end of the vigil, Dupuis asked those in the circle to extinguish their candles, and several seconds of hesitation followed before the lights flickered out. Next, the group walked together down the stairs and out of the TVUC, to the Spirit Wall. 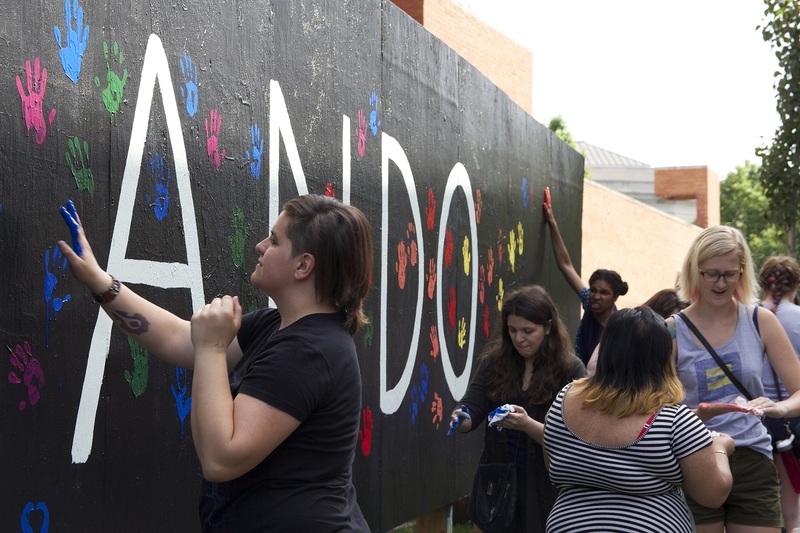 Prior to the event, Dupuis and Tesfai had painted the wall black, with “ORLANDO” and the victims’ names written in white. The silence of the vigil and the plainness of the wall were broken, as attendees talked with friends and acquaintances and added handprints to the wall in a rainbow of colors. As those at CWRU’s vigil worked on the Spirit Wall, the bells began to ring at Church of the Covenant, just down the block. Lynch then gave a prayer for the caregivers and first responders in Orlando, something she had decided to do after hearing how upset the caregivers she works with at UH had been when imagining themselves in their peers’ shoes. After that, Starr Redwine lit candles for sorrow, peace, love and hope. As she read out, “We kindle the flame of hope,” the taper disappeared inside the green glass candle holder, followed by a moment of darkness before the candle’s flame finally flared up. A group of medical students visiting from Chicago walked by and noticed the sign and prayer wall covered in rainbow ribbons. “That’s what a church is supposed to do,” said one of them. “That’s exactly what a church is supposed to do,” another agreed. Cleveland’s Tallest Drag Entertainer Veranda L’Ni already had the stage at Cocktails booked for a drag show on Saturday, June 18. After she heard the news about Pulse, she asked Cocktails owner Jim Tasker if they could hold a fundraiser instead. “People give because they don’t know what else to do,” explained L’Ni. Tasker began accepting donations over the course of the week, and by the start of the event at 10 p.m. on June 18, Cocktails patrons and staff had given around $2,300. Through raffles with items donated by local businesses, jello shots for sale and performers donating their tips, by the end of the evening Cocktails was able to donate over $3,600 to the Equality Florida Pulse Victims Fund. Though Cocktails’ small, nondescript building on Cleveland’s West side—distinguished only by a small neon rainbow in one window—bears little resemblance to Pulse Nightclub, some attendees may have still felt some trepidation venturing there so soon after the attack. According to Cocktails’ bouncer, extra security for the event wasn’t necessary, as the bar has always been high-security. Cocktails wasn’t the only LGBT bar that was moved to action by Orlando; scrolling through the donations made to the Pulse Victims Fund shows donations from LGBT bars and clubs all over the country. As the event wrapped up, L’Ni grew more serious, reflecting on the attack and the need for a change in society. ”Not one person will make us stop what we do here, and at LGBT bars around the world,” said L’Ni. After attending so many events in response to the shooting in Orlando, it still took just one question from Lynch to bring me to tears in the middle of an interview. When I first heard about the shooting, I was afraid. At work on that Sunday, a coworker asked if I had heard. “Yeah,” I said simply, and then went silent as once again my imagination ran through the attack, picturing myself trying to push my girlfriend out of range of an assault rifle. Soon thereafter, I decided to start this story, and I pushed down my own emotions in favor of chasing a story about others’ emotions. Lynch, too, went straight into action. She called a director at the Orlando Regional Medical Center to ask how their hospital dealt with the trauma, thinking of Cleveland’s upcoming Republican National Convention, and she talked her coworkers through their feelings. At the end of our interview, Lynch admitted that it had given her an opportunity to think through her own emotions following the attack, just as it had for me.